Susan Connery Designs has been a seed germinating for a number of years. Painting canvas floorcloths uses a number of skills that I have honed for 30 years in my business The Wall Works. Drawing from my history & love of colors, textures, graphics & designs, I found that creating floorcloths allows me to use all of these skills. One of the threads that has always run through my work ethic is to pay attention to detail. I’m drawn to the smallest details, I want them to be perfect, and I want to make them that way. I’m a gardener and I spend time looking at plants, flowers, and leaves. I take notice of color combinations and textures of leaf, petal or stem, pistils and stamens, pollen. These little details excite me and when I work on my paint or design work, I employ my love of detail so that the end result is completely beautiful. I carry this quality across the board whether I am hanging wallpaper or painting a room. When a call comes in to create a floorcloth, the ideas start flowing. After I have all needed information; I go to work cutting the canvas to size, priming it, hemming it, gathering the paints that will be used, engineering the design onto the canvas, painting it and fine-tune painting. 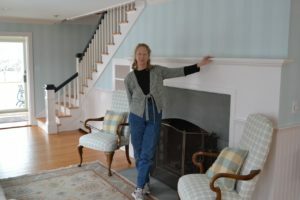 As a decorator and as a woman, I’ve always loved learning how women in centuries past would come up with simple and delightful ways of decorating their homes when budgets were small. Painting a piece of canvas and using it on the floor became one of those easy & economic ways. From paper cutting designs into shelf paper, to making stencils out of heavy paper, (or a potato even), I have always used techniques like these to add a bit of color and design in my own home. I love creating beautiful spaces. Floorcloths are a big part of that.